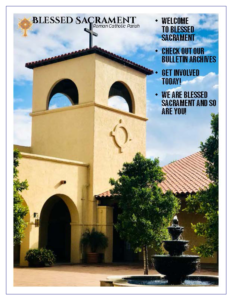 The following is an excerpt from The History of Blessed Sacrament as written in our special 25th Anniversary issue of The View From The Courtyard. On July 8, 1974 Bishop Edward McCarthy of the Diocese of Phoenix announced that, due to the population growth in North Scottsdale, a new Roman Catholic Church would be built at the crossroads of Shea Blvd. and Scottsdale Rd. According to the Chancery, the new parish would be named the Community of the Blessed Sacrament and consist of families currently belonging to St. Maria Goretti and St. Joseph’s parishes. After some initial investigation, it was decided that the new church would be built at the southwest corner of 64th St. and Cholla St. [the street signs say “St.”] Rev. E.J. Fitzpatrick, a pastor from Flagstaff, was named the first pastor, and he began his tenure by meeting with families of the newly established parish. While plans for the construction of the church were being made, Father Fitzpatrick began celebrating masses at Chaparral High School on September 8, 1974. Attendance at masses quickly rose to one thousand each week, and religious education for about five hundred parish children was conducted in rented classrooms at Cocopah Elementary School. The rapid growth of the parish and anticipation about the new church to be built caught the interest of the Scottsdale community. In a 1974 article in the Scottsdale Daily Progress, Father Fitzpatrick was interviewed about the expanding parish and explained how the name of the parish was chosen to stress the ideas of community put forth by Vatican II. Plans for the church were designed with this concept in mind: all the buildings were to be built around a courtyard to provide a central area for fellowship and recreation. 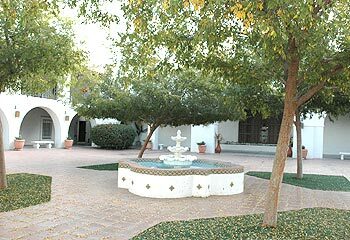 According to the original plans, the new Spanish colonial-style complex with mission roof tiles, arches and an off-white exterior was to sit on a 10-acre building site. The original cost was estimated at $900,000. A house on Cactus Rd. was also purchased to serve as a temporary rectory and meeting hall until the construction was complete. Fr. Fitzpatrick borrowed the unique sum of $999,999.99 from the Diocese of Phoenix. “It was a psychological thing with me not to get to one million,” he said. Once the funding was secured, construction could begin. After nearly three years of construction, Blessed Sacrament achieved its goal and celebrated its first mass at the new complex on October 1, 1977. A procession of about 150 parishioners, led by Father Fitzpatrick, sang hymns and marched more than a mile from the rectory on Cactus Rd. to participate in the event. After mass, parish members held an all-night vigil as the carefully chosen altarpieces were brought into the church. The official dedication mass was held on October 30, with Bishop James R. Rausch presiding. The dedication weekend was also marked by a festive reception, tours of the facilities and performances by Mexican folk dancers and a mariachi band.